The International Code of Signals (ICS) is an international system of signals and codes for use by vessels to communicate important messages regarding safety of navigation and related matters. 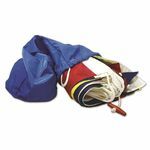 Each 40-Piece Set Includes: Sizes 0, 2, 3, 7, 10 &14, 100% Nylon fabric, Sewn Flags. Finished with heading & grommets, distance line and ash toggle or line snap & ring. Size 14 only available with heading & grommets or snap hook & Ring. Complete sets are supplied with a storage/carrying bag.